The story of Zacchaeus is a favourite story of mine. This short, disliked tax collector could not get through the crowd to see the approaching Jesus. He really wanted to see him and so he climbs a tree. Do you go out of your way to see Jesus, or do you let the crowd get in the way? Zacchaues didn't climb the tree to be seen or to grab attention, only to get a better view. He didn't want anything from Jesus, he's curious, as many people are, about who Jesus is. Jesus takes that curiosity and approaches Zacchaeus, calls him by name and invites himself for dinner! Jesus called him by name. Zacchaeus actually means clean or pure, as a tax collector that is certainly not the life he was living, but it is the name Jesus knew him by and saw him as. My name means fairy queen, which I certainly am not but Jesus knows my name and he called me by name, just as he calls you. Jesus did not preach, tell any stories or demand repentance, he offered a hand of friendship and asked to spend time with this overlooked, disliked little man. This was not popular with the crowd, Zaccaeus was a Tax Collector, a sinner, not just because of his job but because of the way he conducted himself in that job. He was no doubt known for taking money for himself because he immediately offers to pay back what he owes four times over and gives half of his wealth to the poor. This is a pretty dramatic response to being acknowledged by Jesus but I think that this is one of the greatest examples of how simple acts of kindness, like reaching out a hand of friendship, can have a huge impact on a persons life. Jesus was developing a relationship before bringing him to repentance, being in his presence and knowing he was accepted and loved changed Zacchaeus' heart. Unlike the disciples he didn't give up his job to follow Jesus into the mission field, but I would like to think he conducted himself very differently from that day. You do not need to be mission workers, volunteers or preachers to have an impact for Jesus, you are not where you are by accident. Witness in the environment you are in, I am sure the change in the attitude that Zacchaeus had to his work was a great witness to those he worked with and those that he collected taxes from. He changed from being of the world to living in the world. He was lost – Jesus found him. 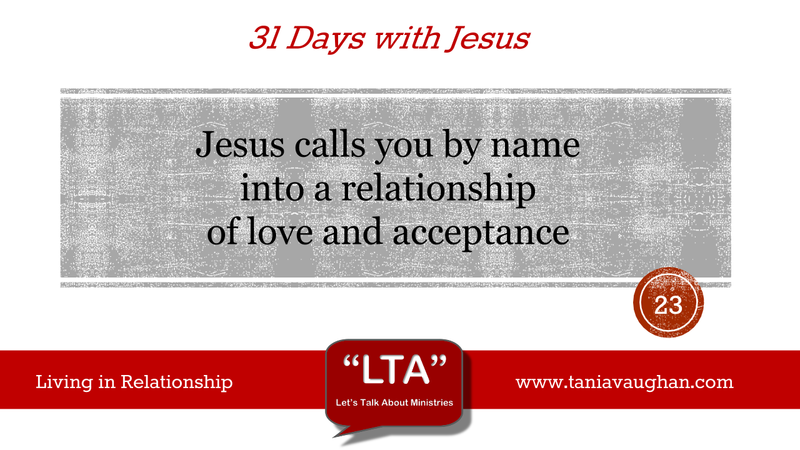 Jesus extends his hand to you, calls you by name and wants to spend time with you. Jesus wants a relationship with you, a friendship, because he loves you. It is this love that overflows from you to extend the same to others by Jesus' example. Lord, I am amazed and thankful you know my name, the world can make me feel insignificant but you know me and are calling me. I want to experience the relationship of being in your presence, knowing that you love and accept me. Lord, as your love overflows in me guide to people that are in need of being known by you. It's a lovely image isn't it? A short unpopular sinner curious about Jesus climbs a tree to take a better look! As you say here, tax collectors were ruthless in their purcuit of wealth - mostly unjustly. Spin forward to the present day; if jesus came now rather than then. JC and his posse of disciples would be walking around town talking and sharing with whoever they met. When suddenly JC called to a drug dealer on the roof of a bus shelter and goes to his home for dinner. How would you feel about that? This is what happens. I love the verse Luke 5:31 where it says it is not the healthy who need a doctor but the ill. Our perception of who JC should associate with is laughable in the face of the reality of why God had to send his only son to save us. If we continue to see ourselves as 'healthy' then we will not see the kingdom of heaven. Once we accept that we will never be well and we are on a course of treatment leading to eternity and welcome JC as the physician into all aspect of our lives maybe we will be more inclined to help treat the sick whichever way we can!